Our most popular self-guided tour, the classic Wild Atlantic Way Tour has been designed for riders who want to to experience the lesser known parts of Ireland on incredible roads! 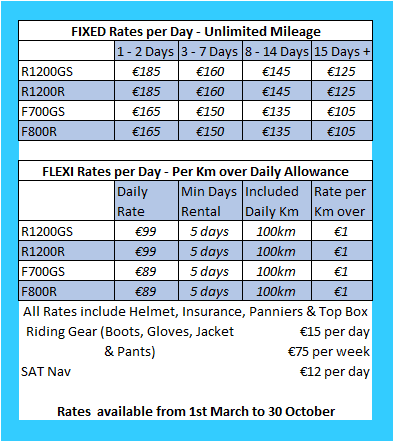 The tour includes 7 days of fantastic riding and 8 nights accommodation, starting and ending at our base in Killarney in the 4 star hotel & spa, The Brehon. The riding is engaging, with plenty of twisty scenic roads. Each day we arrive at a new location after 5 or 6 hours riding. The routes are pre-programmed in detail on our Sat Nav systems, which ensures you see parts of the countryside that ordinary visitors rarely see. Each evening we stay in lively towns where you can relax or engage in the local Irish social scene, normally with a great range of restaurants and pubs to explore. Group Ride Option We have a Group Ride option starting on 9th September 2019. So if you would like to ride in company, please select this date when making your reservation. Bike orientation – We take time to make sure you are comfortable on your bike, have the correct riding gear and understand the routes on our Sat Navs. It’s good to get to us early as this will take the best part of 2 hours. Head south past the Lakes of Killarney on the Muckross Road. As LemonRock is situated right on the Ring of Kerry, it will be only minutes before you are witnessing the most fabulous sights! Ladies View – Needs to be seen to be believed, even on dull days, this is a world class vantage point. The hilltop at the second car park commands the view much admired by Queen Victoria’s ladies in waiting, when they visited here in 1861, hence the name Ladies’ View. Molls Gap – Mountain roads twisting through the hills and countryside. The rocks at Moll’s gap are formed of Old Red Sandstone. 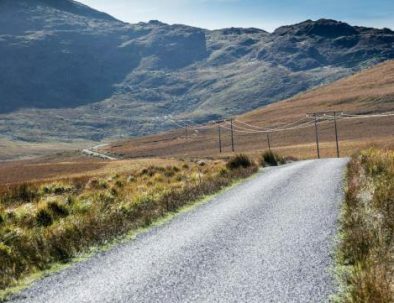 Ring of Beara – We have chosen this peninsula first as it is very remote and quiet leaving you time to get fully acquainted with your bike and not being distracted by traffic. The Caha and Healey passes are truly magnificent and the Priest’s Leap is another spectacular pass for the more adventurous solo rider. Overnight in Kenmare, Co. Kerry. Kenmare is a bustling town and has a superb choice of restaurants to cater for all tastes. Watch out for the “Session Trail Pubs” which host live traditional music and are free for all to enjoy. Accommodation – Friendly 3 Star accommodation right in Kenmare town centre. Dingle – Truly a gem of a town! Dingle is famous for its pubs and music night life and Fungi the dolphin! Our optional rest day stay’s a second night in Dingle. There’s lots to see and do! Slea Head – Start early as this route is very popular with tourists! 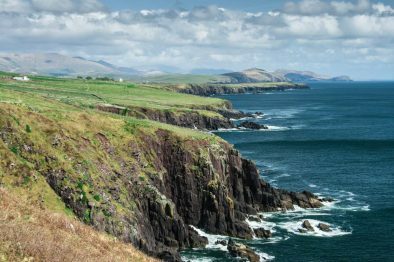 The Slea Head Drive is a circular route beginning and ending in Dingle, that takes in stunning views on the western end of the peninsula. The Conor Pass is the highest mountain pass in Ireland, and provides the most dramatic and scenic way of entering or leaving Dingle. This narrow, twisting road runs between the town of Dingle and Kilmore Cross on the north side of the peninsula on through Castlegregory. It’s a lovely biking route but take time to stop and look back at the views! You’ll pass through Blennerville which was the main port of emigration from Co. Kerry to North America during the Great Famine. Tarbert to Killimer Ferry – We prefer this route instead of riding up through Adare and Limerick, which we will see on the way home. You cross the Shannon Estuary leaving Kerry and crossing into Co. Clare. Here you will appreciate one of the many wonders of the Wild Atlantic Way, with ever changing scenery. The Cliffs of Moher in County Clare are Ireland’s most visited natural attraction with a magical vista that captures the hearts of one million visitors every year and are a Signature Discovery Point in the heart of the Wild Atlantic Way. They stretch for 8km as the crow flies, along the Atlantic coast of County Clare in the west of Ireland and reach 214m (702 feet) at their highest point. Evening is the best time to view the Cliffs, in our experience, as the sun sets west over the Atlantic. Overnight in Doolin or Kinvarra, (depending on hotel availability) This is a very busy spot (and deservedly so!) in high season. So we often have to juggle between hotels to accommodate all our guests. We do the stressing so you don’t have to! Blackhead Lighthouse – more noteworthy for the moon like landscape which slopes down to the Atlantic than for the lighthouse itself, it’s a serene spot to savour. The Burren National Park – The word “Burren” comes from an Irish word “Boíreann” meaning a rocky place. You can spend hours riding around here – its landscape is very different to other parts of the Wild Atlantic Way. We like to visit the Burren Smokehouse (it’s not what you think!) and the set location for Fr. Ted, where Mrs. Doyle lookalikes still serve cups of tea! Ah go on, go on, go on!! Roundstone, Connemara – it’s a very picturesque village by the sea, and have a great selection of restaurants and gourmet food pubs. Visit to Matt Molloy’s pub, in Westport – Matt Molly is a member of the famous Chieftains – where live traditional musicians play 7 nights a week in an authentic intimate setting. Not to be missed! Overnight in Westport, Co. Mayo (3 star) Westport is a regular winner of Ireland Tidiest Town and is truly a gem to visit. Newport nestles on the shore of Clew Bay which is famous for its 365 Islands and is a pleasant seaside resort and part of an attractive and unspoiled coastline. Mulraney – acclaimed as Ireland’s best small tourist town, a European Destination of Excellence – it is a superb stop for taking a walk on the beach and enjoying the spectacular views. Achill Island – Achill has a long history of human settlement and there is evidence that Achill was inhabited as many as 5,000 years ago. Megalithic tombs and promontory forts testifying to this can be seen at Slievemore, along the Atlantic Drive and on Achill Beg Island. Kildamhnait Castle is a 15th century tower house associated with the O’ Malley Clan, who were once a ruling family of Achill. Grace O’ Malley, or Granuaile, the most famous of the O’ Malley’s was born in Clare Island around 1530. Her father was the chieftain of the barony of Murrisk. The O’Malleys were a powerful sea faring family, who traded widely and refused to submit to English rule. Grace became a fearless leader and gained fame as a sea captain and pirate. Ballina, situated on the famous River Moy, is Mayo’s largest town. Enniscrone – There are 5km of safe, clean golden beaches. For eight decades people have come to bathe in hot sea water and seaweed renowned for its therapeutic qualities. Look out for the eclectic glamping village which plans to offer quirky accommodation in a range of vehicles, including London Taxis or 747 jet! Overnight in Beach Bar Guesthouse. Evening dinner included at the Beach Bar. Mountain pass to Easky Lough – this route brings you through one of the more remote parts of Ireland, with only the occasional sheep to keep you company. The road cuts through the Ox mountains and brings you back to nature. A great way to start your day! Swinford to Castlebar has some nice biking roads where you can enjoy the traffic free bends and enjoy the bike. Louisburgh – a charming seaside town, marking the beginning of yet another stunning ride into Connemara. Doolough Pass in Connemara – A world renowned fishery and spectacular views make this a super riding route. Stop off to visit the famine memorial monument. It serves as a reminder of the Great Famine which occurred in Ireland during the mid 19th century, marking one of the most tragic periods in Irish history. The memorial itself is a plain stone cross engraved with the words ‘Doolough Tragedy 1849’. Clew Bay has, according to tradition, 365 islands, one for every day of the year. It’s probably the most beautiful bay in Ireland, and the views of it from all around Westport are spectacular. Most of the islands in the bay are are uninhabited, although a few brave souls cling to the age-old tradition of living on a small island all year round. Killary Harbour located in Leenane, Connemara, Co. Galway, is Ireland’s only fjord. It forms a partial border between counties Galway and Mayo. It is 16 kilometres long and in the centre it is over 45 metres deep. Kylemore Abbey – Definitely worth a visit- Kylemore Castle was built in the late 1800s by Mitchell Henry MP, a wealthy business man and liberal politician. Inspired by his love for his wife Margaret, and his hopes for his beloved Ireland, Henry created an estate boasting ‘all the innovations of the modern age’. 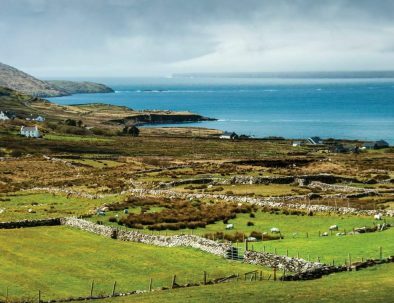 An enlightened landlord and vocal advocate of the Irish people, Henry poured his life’s energy into creating an estate that would showcase what could be achieved in the remote wilds of Connemara. Today Kylemore Abbey is owned and run by the Benedictine community who have been in residence here since 1920. Tarbert Ferry – Back across the River Shannon by ferry, down through Killorglin until we turn off for the valleys and mountains! Ballagh Beama Gap – Ballaghbeama Pass cuts across the mountains in the centre of the Iveragh Peninsula and offers an isolated but breathtaking alternative route to the Ring of Kerry, with remarkably little traffic. This gives the sheep free reign of the landscape! Their is a beautiful flowing stream that flow’s from a higher point on the South near the stunning area that is Ballagh Beama. It is located between Blackwater and Glencar with stunning view’s on either side of this mountainous region. It really does capture the imagination which makes it a must for any photography enthusiast. Strawberry Field Pancakes – a treat awaits those who stop here – famed for its pancakes and indeed a variety of freshly served food. Gap of Dunloe – an iconic Irish landmark – The Gap of Dunloe is a narrow mountain pass forged between the MacGillycuddy Reeks and Purple Mountain by glacial flows. The river running through the gap is the river Loe from where the Gap gets it’s name. The Gap begins at Kate Kearney’s Cottage. The road, narrow in many places, winds through the pass and descends into The Black Valley passing five lakes, Coosaun Lough, Black Lake, Cushnavally Lake, Auger Lake and Black Lough. Within easy walking distance from Kate Kearney’s cottage is a picturesque old bridge known as the ‘Wishing Bridge’. It is said that wishes made here really do come true! Overnight in The Brehon (4 star) – relax in the complimentary vitality suite, which includes a pool with hydro therapy jets, an herb sauna, a crystal steam room, an ice fountain, a tropical shower and a kubledusche. Or consider booking ahead for a spa treatment in the Brehon’s Angsana Spa – a treat to end your week! Transported back to your Airport for flight home. Depending on time of flight, you may have time for shopping in Killarney or relaxing in the excellent Angsana Spa in the Brehon. Paul and the team organized an amazing trip for us. The bike was excellent, the routes were even better. Paul created custom routes for us so we got to see the best of the Wild Atlantic Way. The scenery is stunning, so many incredible views. All the details were considered, great places to eat, drink and stay. We had a wonderful time, and would highly recommend this experience. My partner and I decided to take the plunge on our first ever motorbike tour with Lemonrock, and they served us brilliantly. We took their week's ride on the Wild Atlantic Way, from the beautiful Beara peninsula a little south of Killarney, right up to the awesome panoramas and snow-capped peaks of Connemara and county Mayo. From the start, Paul was engaging, friendly and professional, as was his colleague Don who we met the following morning and again at the week’s end. The BMW bike and hired equipment were both excellent, and the itinerary we were given well detailed. Lots of advice about good meal stops, particular sights worth seeing etc. Paul was easily able to answer additional questions about the route over a welcoming drink at the plush Brehon hotel. As we discovered, the accommodation arranged for us was consistently great. And if you like live music and whisky/Guinness, then the evenings are likely to be particularly enjoyable at a nearby bar or pub anywhere you stay. People everywhere are super-friendly, be they locals or fellow visitors.